CanDo® high quality latex resistive exercise bands has been used in clinics for rehabilitation, conditioning and training since 1987. It is an economic solution for upper and lower body exercise and has become a well-known staple of many physical therapy programs. Each band may be used independently, or as a part of a progressive rehabilitation program. CanDo® bands are licensed to use the TheraBand® color sequence so resistance levels can be easily identified, making switching to this more economical option easy for you and your patients. CanDo® exercise products have been used by physical therapists, athletic trainers and the general public since the 1980s. Their product line includes bands and tubes for strength and rehabilitation, balance and coordination, and flexibility. CanDo® offers a wide range of choice with three different product lines: their regular latex CanDo® bands and tubes, their latex-free bands and tubes called Sup-R-Band®, and their economical bands and tubes called Val-u-Band®. 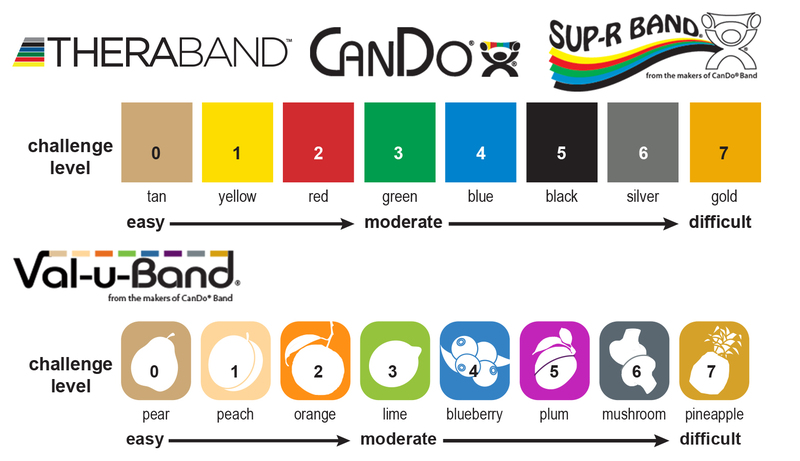 CanDo® and Sup-R-Band® bands and tubes utilize the TheraBand® resistance progression colours which makes switching to these more economical options easier for you and your patients. And if matching the TheraBand® colour sequence is not exactly a priority for you, you can switch to the Val-u-Band® for even more value. The Val-u-Band® line is our lowest cost tubes and bands with the same high quality of CanDo®. It has its own progressive colour system called Berry ColorsTM that saves you money! The CanDo® line of products offers excellent performance and great value. Vitality Depot offers CanDo® bands in individual size, 6 yards, and 50 yards, Sup-R-Band® bands in individual size, and 50 yards, and Val-u-Band® bands in individual size, and 50 yards. Each band and tube comes with consumer friendly retail packaging. Sometimes The original, trusted brand. Safer, snap resistant design. TheraBand® colours. More economical. Performs just like latex. TheraBand® colours at economical price. No need for second inventory. Lowest price. Same quality. Berry colours save you money!